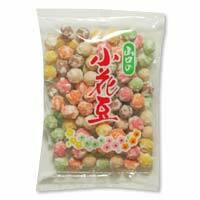 Crunchy peanuts, sugared and coated with crunchy red, yellow, and green candy shells made with glutinous rice flour. Add just a tiny dash of salt to bring out the sweetness of the peanuts. The assortment of vivid colors, like a meadow of wildflowers, give this snack its name, Florets.